Diamond fluorescence is a reaction from trace minerals in the diamond when passed under an ultraviolet light. When exposed to UV light, the diamond emits a visible glow. The resulting glow is almost always blue with yellow being the second most common color. Other colors are possible, but rare. Fluorescence in a diamond has long been considered to be a negative aspect as it supposedly affected the color grade of the stone, causing it to look a higher grade than it really is. However, fluorescence can be beneficial in that it gives a diamond a whiter appearance even if it is a lesser color grade. Diamonds are created from intense pressure applied to carbon in the earth's crust. The nature of their creation means other minerals get trapped into the diamond crystal as it forms. Sometimes these are visible as inclusions so small that they're only visible with the aid of a loupe or microscope. The trace minerals that cause the fluorescence won't be visible to the eye, or even under a microscope, yet they make themselves known when passed under a UV light. When a diamond is graded, it's tested for fluorescence. The scale includes none, faint, medium, strong and very strong. As little as a quarter of all diamonds react to UV light, and less than ten percent of those that do react have a strong enough glow to affect the color of the diamond under normal light. Only the strongest of fluorescence has the ability to affect the color of a diamond in normal lighting conditions. 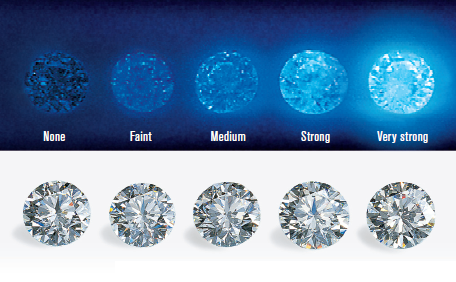 It's considered a positive when the stone has a lower color grade, such as K or L. In the lower color grades, blue fluorescence brings up the color to a whiter appearance, making the diamond look brighter than it really is. Does Fluorescence Affect the Value of a Diamond? Fluorescence is usually a positive benefit if the diamond has a lower color grade. It turns what would otherwise be a lesser-quality diamond into something more visually exciting, especially when put into a setting. The diamond may cost less due to its grading while appearing to be much more than it really is thanks to fluorescence. When it comes to fluorescence, we recommend that our customers choose none or faint. We do not recommend medium, strong, or very strong as it can interfere with the overall sparkle of the diamond. Inter-Continental Jewelers carries top Houston diamonds at the best prices. Contact us today at (713) 785-9600. We have an extensive selection of diamonds among other gems in a wide variety of styles.